A motor vehicle accident can change a life in a matter of seconds. If your life has been changed by an auto accident, if you or a loved one has suffered a serious injury because of another driver's negligence, the Naples personal injury attorneys at the law offices of Friedman, Rodman & Frank, P.A., can help. By bringing more than 100 years of combined experience into play, we know how to get results. What caused the auto accident? Was a drunk driver involved? Did a defective product play a role? The answers to these questions can play an important role in determining the options available to maximize your compensation, which is our goal. In cases in which we cannot collect compensation from another driver because that driver does not have sufficient insurance coverage, there are options. Your own insurance company may be able to compensate you. 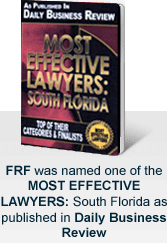 Our lawyers understand Florida no-fault auto insurance laws. We know how to use underinsured and uninsured motorist coverage (UM and UIM coverage) to your benefit in hit-and-run accidents and other cases. Remember this: You may have more options than you are aware of. We know the options. We can educate you about them. We can take advantage of them, fighting hard to get you all of the compensation you need. After a motor vehicle accident, there is often a question of how the damage to the victim's vehicle will be handled. While we focus on getting you compensation for your injuries, we also handle property damage matters at no fee. We will work with the insurance companies involved to make certain your vehicle gets properly repaired or replaced. Call us toll free at 877-448-8585 or contact us online to speak directly with a Naples automobile accident attorney in English, Spanish or Creole. Se habla español/Nou parlé Creole. We are available to assist you 24/7.